Terming Congress and Aam Aadmi Party as the enemy parties of Punjab, the Chief Minister Parkash Singh Badal today called upon the people of Punjab to distinguish between own people and strangers and ensure that the reigns of state are given in safe hands.Addressing the people during Sangat Darshan in Budhlada assembly constituency, Mr. Badal warned the people of Punjab that the Congress party-which attacked the most holy place of Sikhism Sri Darbar Sahib, killed thousands of innocent Sikhs in Delhi and always taken away the rights of Punjab – can never think about the betterment of Punjab. He added that the Congress has ruled over country for a long time but has always committed economic, social and religious atrocities on Punjab. He said that SAD was the party that has always worked to safeguard interests of for Punjab, Punjabi and Punjabiat.Terming the Delhi Chief Minister Mr. Arvind Kejriwal as anti Punjab, he said that neither Kejriwal was aware of the issues of Punjab nor he knows about people of Punjab. He said that the AAP had no agenda for development and promotion of the Punjabis and was trying to entice the voters by mere slogan raising. He said that the governments do not work on baseless slogans instead one has to set agendas for development and take initiatives to wipe off miseries of people. 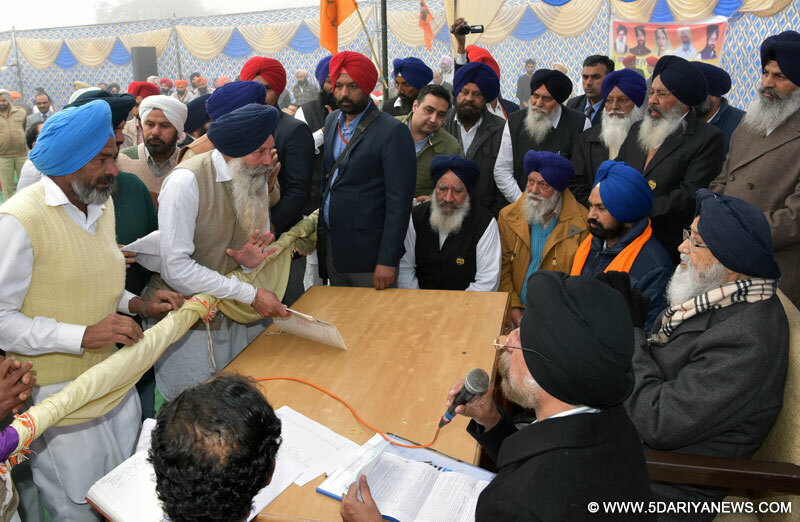 He said that the agenda of SAD-BJP coalition has always been that of development, brotherhood and in future the coalition will reiterate this agenda,Warning the people of Punjab, Mr. Badal said that if the Congress or AAP comes into power even mistakenly, these parties will stop the benefit of free power, water, atta dal, shagan scheme and many other benefits being given to them. He asked the people of Punjab to remember that when Captain Amarinder Singh government was in power, he had stopped the benefit of free power and water and the same was reinstated after the SAD-BJP coalition raised voice for it. Similarly, Captain has imposed blanket ban on government recruitments.Answering media query on assembly segment from where Mr. Parkash Singh Badal will contest the elections, he said that he will follow the orders of party in this context. He said that in politics the party is supreme and his entire life he has been following the orders of party.Holding Congress responsible for the Satluj Yamuna Link fiasco, the Chief Minister said that the Congress leaders are puppets in the hands of high command. Giving an instance he said that when the former Prime Minister Mrs Indira Gandhi forced the then Chief Minister Mr. Darbara Singh to follow her diktat on issues of water. Thereafter, playing another trick with Punjabis she herself started the digging up work of the SYL canal in Punjab. Chief Minister said that the history was witness that when the digging was started, he (Mr Badal) and other Akali leaders have got themselves arrested protesting the move, whereas Captain Amarinder Singh was present with his leaders and happy over the turn of events to appease his leadership.Terming AAP has a two-faced party, he said that the AAP has already shown its real face by submitting an affidavit in the Supreme COurt over water issue. Asking help of people for fighting over the issue of Punjab waters, he reiterated that not even a drop was water will be spared for anyone and he was ready to give any kind of sacrifice for that. He added that already Punjab had sacrificed its natural resource water to feed the nation and now if this water was given to other states, Punjab would be devastated,Highlighting the initiatives of present SAD-BJP government he said that every year Rs 6000 crore are given as free power to the farmers. He added that Punjab was the only state to give atta dal for the poor in state and the diseases like cancer and Hepatitis-B are being treated free of cost. Besides this, the farmers are provided health insurance upto Rs 50,000 and if the head of family is lost in any kind of accident, then the family gets Rs 5 lacs. He added that the farmers associated with cooperative society are given Rs 50000 interest free loan.Talking about sangat darshan he said that these programs are held to listen to the problems of people. He said that only that who has risen from amongst the people can understand problems of common man. He said that Captain Amarinder Singh instead thought it was disadvantageous for him to move amongst the commoners and wanted to stay alone in his royal house.The CM today conducted Sangat Darshan of villages Borawal, Akkanwali, Reond Kalan, Kulrian, Budhlada etc. The SAD-BJP candidate from area Dr Nirmal Singh, special principal Secretary to CM Mr KJS Cheema, DC Mr. Varinder Sharma and others were present.